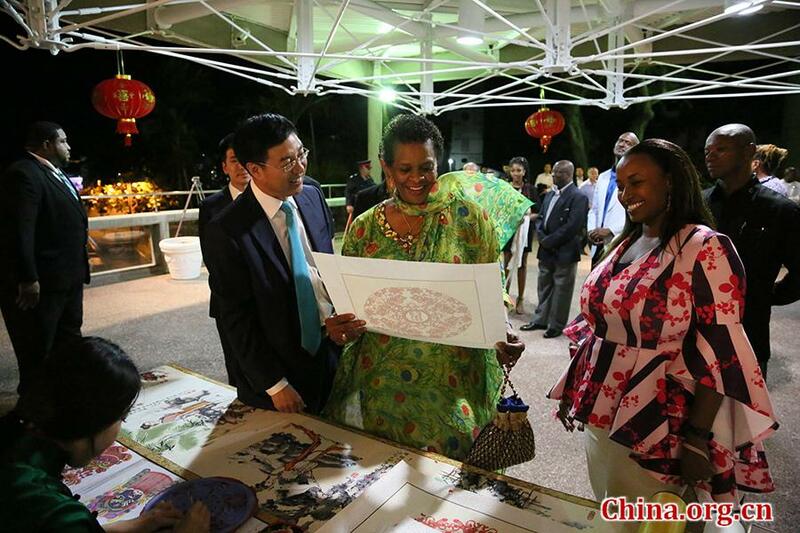 Yan Xiusheng (L), Chinese ambassador in Barbados, shows Sandra Mason (C), governor-general of Barbados, the intangible cultural heritage skills of Beijing, Tianjin and Hebei in Bridgetown, capital of Barbados, on Jan. 22, 2019. A celebration of the Chinese New Year kicked off with a famous Chinese folk song "Jasmine Flower" in a gala in Bridgetown, Barbados, on Jan. 22. The gala is the first of an event series called "Happy Chinese New Year, Charming Beijing, Tianjin, Hebei." 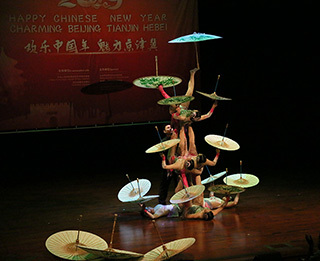 Artists from the northern Chinese region presented a variety of performances with rich Chinese cultural flavors, including acrobatics, Peking Opera, and martial arts. The stage performances won waves of applauses from the audience, among whom were the Chinese ambassador in Barbados Yan Xiusheng. Also on display at the venue were various intangible cultural heritage skills, including costumes of Peking Opera, woodprints of an ancient town of Tianjin, paper cuttings of Hebei province's Wei county. The event series will continue with a reception and performances in other locations in Barbados, as representatives and performing artists from the Beijing-Tianjin-Hebei region hope to bring the festival spirit of the Chinese New Year to all corners of the island. The activities were organized by the press offices of the local governments of Beijing, Tianjin, and Hebei province, and the Chinese embassy in Barbados. Similar "Happy Chinese New Year" activities will also soon land in Beverly Hills in the American city of Los Angeles.